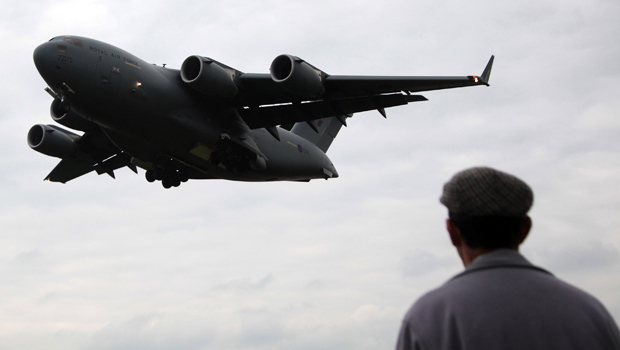 LONDON Officials say a Royal Air Force plane carrying $1,289,000 in cash is traveling to Cyprus to provide contingency funds for possible use by British military personnel and their families. The Ministry of Defense says the money will provide personnel stationed on the Mediterranean island with emergency loans in case the cash machines and debit cards stop working there. C-17 cargo jet: Boeing, Boeing, gone? Cyprus' economy has been in turmoil since the harsh terms of a bank bailout were announced several days ago. About 3,000 British military personnel and 3,500 of their family members are stationed in Cyprus. The ministry said Tuesday it would consider further shipments if required. It said it also is considering making salary payments to employees in their U.K. accounts instead.